Help us to keep the memories alive. 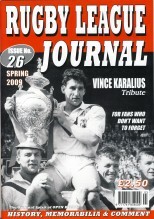 be able to keep producing publications that try to preserve the history and heritage of Rugby League, and bring enjoyment to fans of the game of all ages, especially senior citizens. We ask for a minimum annual donation of £10 to be listed as a “Friend” or £25 to be a “Patron” and you can. if you wish, choose to include it as a memorial dedication in memory of someone special.